Vaccination (Immunization) - body, last, viral, contagious, causes, What Are Vaccinations? Vaccination (vak-sih-NAY-shun) is a way of producing immunity * to certain diseases by giving a person a small amount of an inactive, altered, or weakened form of a microorganism. Before about 1800, a dangerous disease known as smallpox killed millions of people throughout the world. All that was soon to change as the result of an observation made by Edward Jenner, an English country doctor, in 1796. Jenner reported that milkmaids who milked cows infected with an animal disease called cowpox did not contract smallpox. Instead, the milkmaids had a mild case of a similar rash-producing disease. Jenner concluded that cowpox must somehow protect these milkmaids against the smallpox infection. As an experiment, Jenner deliberately gave people the mild cowpox infection to protect them against the more dangerous smallpox infection. Jenner was experimenting with vaccination, or immunization. He discovered that the body's natural defense system can be stimulated to become more protective against a specific infection after being exposed to a similar or weakened version of that infection. In the late nineteenth century, the French scientist Louis Pasteur further developed the concept and named it vaccination, a word derived from the Latin word for cow, vacca. The first vaccine Pasteur developed was against sheep anthrax (AN-thraks). Since Jenner's time, scientists have developed many types of lifesaving vaccinations, including ones against polio, measles, diphtheria, and pertussis (whooping cough). These vaccinations have prevented disease and saved hundreds of millions of lives. Vaccinations activate the body's immune response to protect against certain diseases. Small amounts of weak antigens * , substances found in disease-causing organisms such as bacteria and viruses, are given to a person, usually by injection (a shot). When they enter the body, those antigens train infection-fighting white blood cells to recognize the antigen quickly in the future and respond if the real bacteria or viruses enter the body. When the body's immune system * can respond rapidly and effectively to fight off the infection so that it cannot spread and cause disease within the body, the person has developed resistance to the illness. Booster doses of vaccines (further doses given months or years after the first immunization dose) take advantage of the immune cells' "memory" of specific antigens from the first vaccinations to build even greater immunity. When the white cells that recognize the antigen are exposed to it again after a booster dose, their memory of the infectious agent is strengthened and reinforced. Some vaccinations require booster doses, whereas others do not. Immunizations protect more than just the people who receive them. They also protect people around those who have been vaccinated, a concept called herd immunity. A vaccination protects a person from contracting and then spreading an infection. When enough people have been immunized in one area, the infectious germ has difficulty spreading. It is much less likely to be passed on, even to the few people who are not protected against it. It is estimated that this herd effect occurs when about 95 percent of the people in a given community receive immunizations. Vaccinations boost immunity through a so-called active process, meaning that in response to an antigen, the body's immune system reacts actively. This is not the only form of immunity boosting our bodies receive. Infants are born with a passive natural immunity that protects them from some diseases. This immunity comes from the protective antibodies * passed from a mother to her baby in the womb and, later, through breast milk. A mother who has immunity against tetanus (lockjaw), for example, will pass this immunity along to her baby through antibodies while she is pregnant. This immunity is only temporary, however. An infant's passive immunity (those antibodies from the mother) disappears in the months after birth. The infant later will make his or her own antibodies after being exposed to an infectious agent or receiving a vaccine. * antigens (AN-tih-jenz) are substances that are recognized as a threat by the body's immune system, which triggers the formation of specific protective antibodies against the substances. Vaccinations are one of the greatest success stories of public health programs in the twentieth century. Widespread use of immunizations has brought about dramatic decreases in the number of cases of certain potentially deadly and disabling childhood diseases. Before measles vaccination began in 1963, for example, an average of 500,000 measles cases and 500 measles-associated deaths were reported each year, according to the U.S. Centers for Disease Control and Prevention (CDC). Compare those high numbers with the number of cases after immunizations began. In the year 2000, only 86 cases occurred in the United States, and there were no deaths. In the 1920s, before vaccination for diphtheria was available, 150,000 cases occurred annually in the United States, on average. Diphtheria is a particularly frightening and painful disease. The thick mucus * produced in the course of the disease closes the airway and can lead to suffocation. Since the introduction of diphtheria immunization, millions of people have been protected from this disease. Polio is another disease that once provoked fear. Tens of thousands of people who had polio needed leg braces to walk, because the poliovirus damages the nerves of the leg muscles. As a result of this viral infection, paralysis * could progress, and patients could die of respiratory failure * through paralysis of the diaphragm (DYE-uh-fram), the chief muscle used for breathing. In 1952, there were more than 21,000 cases of paralytic (pair-uh-LIH-tik) polio in the United States. Since the introduction of polio vaccine in 1955, the incidence of this disease steadily declined, and there have been no naturally occurring cases in the United States since 1979. Around the globe, smallpox is the only disease that has been eradicated through an aggressive international immunization program. This highly infectious disease once could kill as many as 1 of every 3 infected people, but the last known naturally occurring case was reported in Somalia, Africa, in 1977. The twentieth century saw not only the tremendous success of vaccines but advances in vaccine technology as well. Some old vaccines have been improved, and new vaccines have been introduced. There are four different types of vaccines currently available. Attenuated (ah-TEN-yoo-a-tid), or weakened, types of vaccine contain live but weaker forms of a virus. These weakened viruses usually do not cause disease symptoms, but they do stimulate the body to develop immunity to the virus. Examples of attenuated vaccines include the combined vaccine for measles, mumps * , and rubella * (German measles), known as the MMR vaccine, and the vaccine for varicella (var-uh-SEH-luh), or chicken pox. Although these immunizations last longer than others, they occasionally create serious infections in people, particularly those with weakened immune systems, sometimes called compromised immune systems. Killed, or inactivated, viruses or bacteria are used in other vaccines, such as the one for influenza * . These organisms are not live, but they do cause an immune response in the body. These vaccines are considered safe for people with weakened immune systems. * rubella (roo-BEH-luh) is a viral infection that usually causes a rash and mild fever. * toxin is a poison that harms the body. 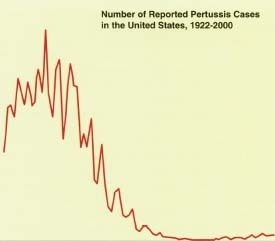 The policy of vaccinating children against pertussis, or whooping cough, has caused a dramatic drop in the number of annual cases in the United States. by an infecting organism, the body's immune system responds. Diphtheria and tetanus vaccines are both of the toxoid type. Biosynthetic vaccines include man-made substances. One example is the Hib (Haemophilus influenzae type B * ) vaccine, which contains two antigens that scientists have combined to make something called a conjugate molecule. Subunit vaccines contain the parts of a particular microorganism that trigger the immune response, but not the whole microorganism itself. The acellular (meaning it contains no whole cells) vaccine for pertussis is an example of a subunit vaccine. What Are the Recommended Vaccinations? Vaccines can be used to protect people against more than a dozen diseases, though most people do not get every possible immunization. On a regular basis, a number of national organizations (such as the CDC and the American Academy of Pediatrics) review the list of available immunizations and make recommendations concerning who should get them, how often, and under what circumstances. There are several well-known immunizations available now. * Hoemophilus influenzoe type B refers to bacteria that can cause serious illnesses, including meningitis, pneumonia, and other infections. Hepatitis * B vaccine (HBV) protects against hepatitis B, a virus that infects the liver. People who are infected can develop long-term illness such as cirrhosis * of the liver or liver cancer. Hepatitis B infection is one of the most common causes of cancer worldwide. HBV usually is given as a series of three injections: one shortly after birth, another at 1 or 2 months of age, and the third at 6 to 18 months of age. Pneumococcal (nu-moh-KAH-kal) conjugate vaccine (PCV) offers protection against many infections caused by pneumococcus (nu-moh-KAH-kus) bacteria, including pneumonia * , meningitis * , and sepsis * . PCV immunizations are given as a series of four shots when an infant is 2, 4, 6, and 12 to 15 months old. The vaccine for diphtheria, tetanus, and pertussis protects against these three diseases. DTaP, as it is called, is a series of five shots, usually administered when a child is 2 months, 4 months, 6 months, 15 to 18 months, and 4 to 6 years old (or before starting school). Five years after these immunizations, generally at age 11 or 12, children receive a booster shot for tetanus and diphtheria, called Td. Doctors recommend that people receive Td boosters once every ten years after that, throughout adulthood. Hib vaccine for Haemophilus influenzae type B bacteria, which were once a leading cause of meningitis in children, is given by injection at ages 2, 4, and 6 months. A booster dose is delivered at 12 to 15 months. The inactivated poliovirus vaccine (IPV) for polio is given by injection at ages 2 months, 4 months, 6 to 18 months, and 4 to 6 years (or before entering school). MMR vaccine protects against measles, mumps, and rubella. The vaccine is administered in two doses, the first at age 12 to 15 months and the second before a child starts school, generally at age 4 to 6 years. Varicella vaccine provides protection against chicken pox, a common childhood viral illness. Children are immunized with a shot of varicella vaccine between the ages of 12 and 18 months; older children and adults who have never had chicken pox also can receive the vaccine. Children who travel or those with special conditions may need other types of vaccines as well. An influenza vaccine, or "flu shot," is particularly recommended for children with certain conditions, including diabetes * and sickle-cell disease * , that could put them at risk of serious infection. Recent recommendations advise that children between 6 months and 2 years of age receive the flu shot, because they are also at risk of serious problems associated with the infection. Vaccination for hepatitis A, a disease that particularly affects the liver, may be necessary for people who visit or live in certain areas where the disease is prevalent. A rabies * vaccine typically is administered after a person is bitten by an animal that could have the disease or when a person plans to spend more than 30 days in a place where rabies is common. * rabies (RAY-beez) is a viral infection of the central nervous system that usually is transmitted to humans by the bite of an infected animal. Children are not the only people who are immunized routinely. Adults sometimes require vaccines too. For example, adults generally need a tetanus booster every 10 years, and older adults or those with certain medical problems are advised to get a flu shot every year. Adults who did not undergo immunization as children, those who have emigrated from a country where vaccines are not readily available, or those who travel to areas where there is a higher risk for certain infectious diseases also receive vaccinations. Vaccinations have been shown to lessen the incidence of certain diseases and even to wipe some of them out. Still, some parents are reluctant to vaccinate their children because they fear that the injection will be too painful or they worry about possible reactions. Other parents mistakenly believe that with lower rates of certain diseases in the United States, regular vaccinations are no longer necessary. A dramatic example proves otherwise. The United Kingdom, Japan, and Sweden cut back their use of pertussis vaccine in the 1970s, when some people feared that it was unsafe. Between 1971 and 1979, the United Kingdom experienced more than 100,000 cases of the disease and 36 pertussis-related deaths. From 1974 to 1979, Japan's vaccination coverage dropped from 80 percent to 20 percent, while the annual number of pertussis cases rose from a low of 393 in 1974, with no deaths, to a 1979 epidemic * high of 13,000 cases and 41 deaths. In Sweden, the annual incidence of pertussis per 100,000 children up to age 6 leapt from 700 in 1981 to 3,200 in 1985. Another common belief is that vaccines cause the infectious diseases that they are trying to protect against. In fact, killed vaccines or those made from only a component of the infectious agent, such as a protein, cannot cause the infectious disease. In addition, constant efforts are made to minimize the possibility of contracting a disease from a live vaccine. For example, in January of 2000, the Advisory Committee on Immunization Practices recommended that the polio vaccine be switched from an attenuated oral version to a killed vaccine, to eliminate the tiny risk of contracting vaccine-associated paralytic polio. Although the live oral vaccine was largely responsible for ridding the United Sates of polio, it caused polio in 1 of every 1.4 million people who received their first dose of the vaccine. The killed version, however, cannot cause polio. Although immunizations prevent many cases of serious, and even fatal, illness, some people experience side effects after receiving an immunization. Relatively common side effects for a number of immunizations may include low fever; mild pain, tenderness, and redness at the site of the injection; a rash; and irritability. Less common, but more serious reactions include seizures * , usually as a result of fever, and an allergic reaction to parts of the vaccine. Reports that link childhood vaccinations to autism * , sudden infant death syndrome * , and brain damage have not been proved, though research continues. * epidemic (eh-pih-DEH-mik) is an outbreak of disease, especially infectious disease, in which the number of cases suddenly becomes far greater than usual. Usually epidemics are outbreaks of diseases in specific regions, whereas widespread epidemics are called pandemics. * autism (AW-tih-zum) is a developmental disorder in which a person has difficulty interacting and communicating with others and usually has severely limited interest in social activities. * sudden infant death syndrome, or SIDS. is the sudden death of an infant less than a year old that is not explained even after an autopsy or examination of the death scene. Most cases occur while the otherwise well baby is asleep on its stomach. Vaccination provides the best protection against certain childhood diseases, and preventing the spread of such infections is vital to public health. Not only do vaccines protect the people who receive them, they also keep the illness from spreading to people who have not been vaccinated. Modern technology has led to the development of many effective vaccines. Technology also has made travel from region to region and country to country much easier than in previous centuries. As diseases that once were rarely seen in the United States are now more readily "imported" from other parts of the world, it is even more important to get immunizations. If people start to believe that they or their children do not need immunizations or if they depend on others to be vaccinated, overall vaccination levels might drop. That could lead to the return of diseases that can be prevented by vaccination. Medical researchers are working to develop more vaccines for a wide range of illnesses, including HIV/AIDS. In general, however, such research takes years and is expensive to carry out. Because almost all vaccinations carry some risk, an important part of their development is to assess how effective they are and whether the benefits of a new vaccine outweigh the risks. U.S. Centers for Disease Control and Prevention (CDC), 1600 Clifton Road, Atlanta, GA 30333. The CDC provides information on vaccinations and the diseases they can help prevent at its website. KidsHealth.org . KidsHealth is a website created by the medical experts of the Nemours Foundation and is devoted to issues of children's health. It contains articles on a variety of health topics, including vaccinations.